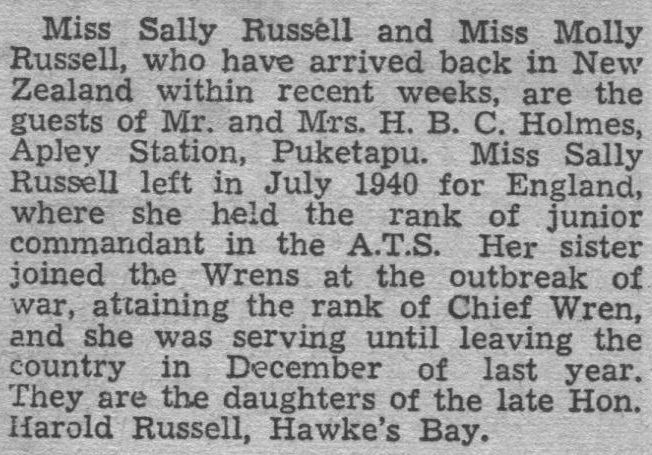 Miss Sally Russell and Miss Molly Russell, who have arrived back in New Zealand within recent weeks, are the guests of Mr. and Mrs. H. B. C. Holmes, Apley Station, Puketapu. Miss Sally Russell left in July 1940 for England, where she held the rank of junior commandant in the A.T.S. Her sister joined the Wrens at the outbreak of war, attaining the rank of Chief Wren, and she was serving until leaving the country in December of last year. They are the daughters of the late Hon. Harold Russell, Hawke’s Bay.